Discuss the need for player and spectator safety in gymnasiums. Identify the various components and stakeholders inside a gymnasium. Define the standards and features to consider to ensure player and spectator safety. Explain the specification and installation of gymnasium equipment. Describe green certifications for gymnasium equipment. On a winter day in 2013, as Lori Williams sat in bleachers in a high school gymnasium in Weeping Water, Nebraska, to watch her sons’ wrestling matches, she had no idea her life was about to change forever. A heavy retractable basketball backstop/backboard assembly swung loose, smashing into the backs of spectators sitting below. When it was all over, four people—two children and two adults—had been injured. Williams was hurt the worst when the edge of the backboard smashed into her back, crushing vertebrae and damaging her spinal cord, leaving her with paralysis in her lower legs. Photo courtesy of Draper, Inc.
Gymnasiums are thought of as venues for positive activities such as fitness and athletic competitions. But gymnasiums are complex settings, and unless they are designed and equipped with safety in mind, injuries and even death can be the result. The focus of all gymnasiums is and should be positive. Professional and serious athletes train and test themselves. Recreational users get physically fit while having fun. Spectators sit or stand to cheer on accomplishments and competitive events. However, a gym is an inherently dangerous place. Balls, bodies, and equipment often move with great speed and force. At times, multiple sports and activities take place simultaneously in a relatively confined space. As in the case of the backboard incident, heavy equipment from one sport may be tucked away while other sports or competitions occur. All of those people inside the gym—whether using the gym or spectating—should have a reasonable expectation of personal safety in terms of the gymnasium equipment. 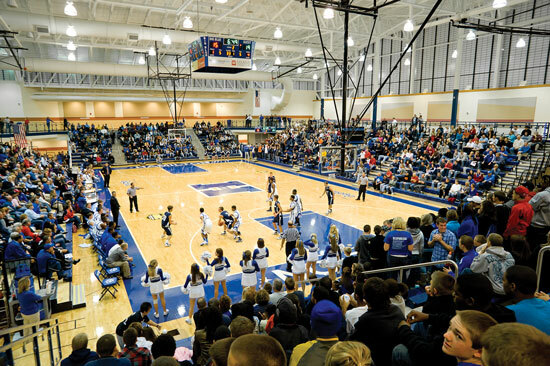 To ensure that level of safety, the gymnasium designer, specifier, or architect should know and understand not only the importance of safety, but also how to achieve it. Basketball backstops can weigh thousands of pounds and tend to be located high up in the gymnasium. Unless they are secured safely, both when in use and when retracted between times of use, people below are in danger.